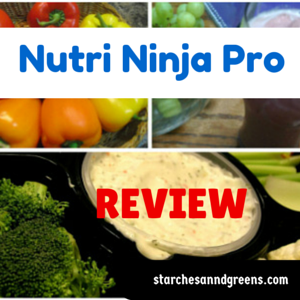 I am excited to review the Nutri Ninja Pro-BL450. The Nutri Ninja is similar to the Nutribullet. It is a personal blender and can be used as a ecounter blendr. It is slightly larger than the Nutribullet and it is my impression that is a bit more robust than the later one. The Nutri Ninja is a personal blender, You can only prepare one or two cups at a time, and you can grab the cup and take it with you wherever you are going. So your blending containers gets to be your drinking cup. 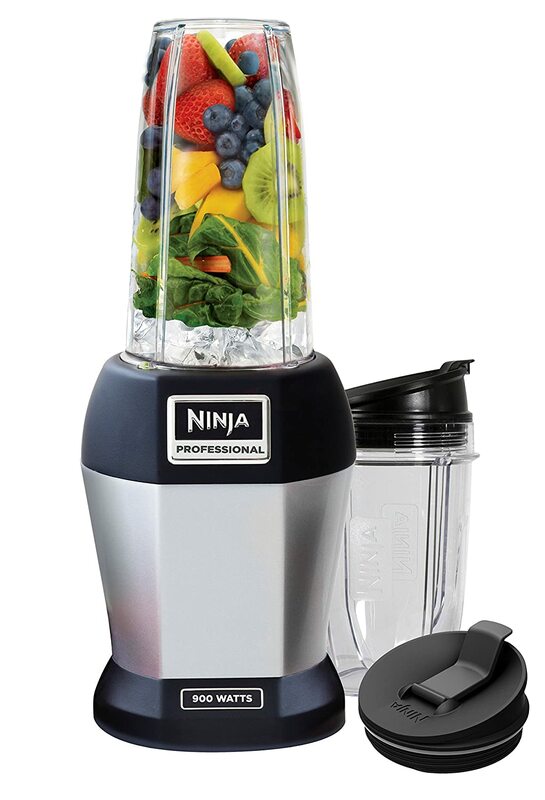 The Nutri Ninja is quite powerful, it comes with a 900 watts motor. The basic Nutri Ninja works like the Nutribullet. It does not have any buttons. The jar or cup acts as the pulse button. The only difference is that the Nutri Ninja Pro is not hands free. You cannot lock the cup and let it run while you do other things. But by pulsing it, you have control over the blending process. You pulse until the food achieves the consistency that you want. The cups are narrow so they fit a standard cup holder. Like the Nutribullet, the Nutri Ninja is not really a juicer. They claim that it is a nutrients extractor. But my opinions is that it blends the ingredient, finely grinding the fruits, vegetables and their seeds. From the many reviews that I researched, this blender does a good job pulverizing the fruits and vegetables. You cannot feel the pulp of the fruit or vegetable. So it would feel like a juice. The longer you pulse the smoother the result will be. . This is a powerful blender. Most of the reviews agreed that the Nutri Ninja is more powerful than the Nutribullet. The end result is a finer drink. Some people have used it to grind spices and coffee, even though the instruction manual says that it cannot run with dry goods. I decided to research this and I contacted the manufacturer. Their answer was that it can grind, but because it is not a grinder the results will not be as good as with a proper grinder. Just a warning , that parts and accessories are not interchangeable with other Ninja models. 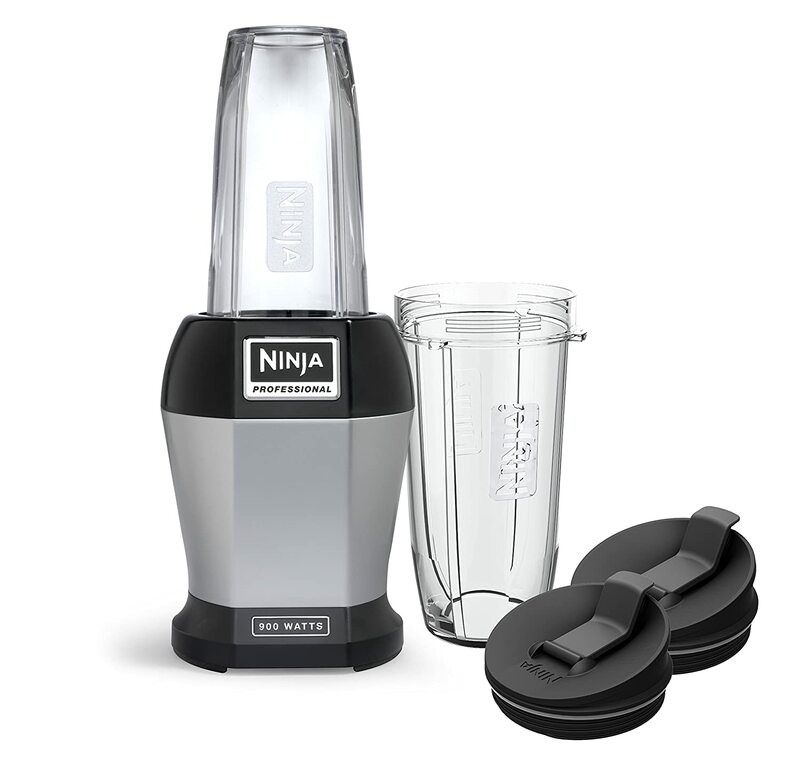 The Nutri Ninja Deluxe BL451 Blender. The Nutri Ninja Deluxe comes with an additional 12oz cup and an additional Sip & Seal lid. If you need more recipes, there are plenty of recipes online for free. 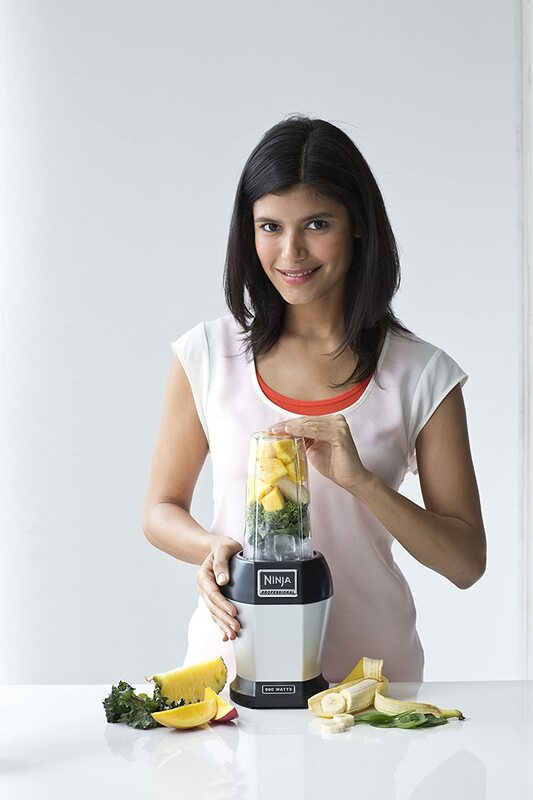 The Nutri Ninja Pro is simple to operate. There are no buttons to get confused. The cup will be your pulse button. So just fill the cup with your ingredients up to or below the max line, screw the blades on the cup, turn it around and press the cup to pulse. As mentioned above the Nutri Ninja is not a juicer, but they call it a vitamins and nutrient extractor. In simple words it pulverizes the fruits, vegetables, nuts and seeds and combines it into a smooth drink. The longer you pulse the smoother and finer the drink. The McDougall program does not recommend smoothies, but sometimes it is the only way to get your kids to eat vegetables and fruits. You can also use the blender to prepare sauces, dips , chopping, vegetables, blending and crushing ice or frozen fruits and vegetables. – desserts, blending frozen fruit into ice creams. – Blender will grind but the result cannot be compared against the result of a dedicated grinder. The NUTRI NINJA Pro™ Pro is a high powered innovative tool with a compact design and outstanding performance. Like the Nutribullet, the Nutri Ninja is very convenient. It is easy to use and clean. There are no complicated buttons. You can prepare a drink for one person or for two. You can use the cup as a drinking cup or pour the mix into another drinking cup. The Nutri Ninja needs liquid to function. The cups come with a max line which indicates that you should fill the ingredients up to the maximum line. If you fill more than the max line then the cup may leak. There were some complaints of people saying that the unit leaks. Perhaps they overfilled the cup. Some reviews also mentioned that the sip and seal lid does also leak. This could be a problem You need to ensure that you always carry it in a vertical position or that you pour the contents into your own container. Since the cup is not really large, you need to cut the fruit and vegetables into smaller pieces. You cannot place the whole fruit or vegetable in the cup, It will not fit. Some reviews mentioned that it did not pulverize the berry seeds. Berry seeds are quite hard, so you need to pulse longer if you do not want to feel the seeds. Nut butter, in genera,l are prepared with dry ingredients, the Nutri Ninja cannot handle it, unless you add some honey. But if you prefer just pure nut butter (no other ingredient), then this blender will not serve that purpose. The Nutri Ninja bullet standard version comes with two BPA free plastic cups. 1x short cups size: 18 oz (0.53 liters) – used mainly for grinding and preparing food. This one is too small for smoothies. 1 x long cup size: 24 oz (0.70 liters) – used for smoothies. The cups come with Sip & seal lids. The lids can be used to take your drink away. Cups fit in a regular car cup holder.So you can prepare your drink, go out the door, and take the drink with you. The cups are NOT microwave safe. All cups and lids are dishwasher safe on the top rack of the dishwasher. You can always buy extra lids and extra cups. Check the accessories section. The cups have a maximum line. You should never fill up the cup above this maximum line. The maximum line is a bit difficult to see though but look carefully because it is there. If you fill above the line the unit may leak. Lids do not seem to be leak proof, so I would not put the cup in my bag. The cups do not have measuring lines. It would have been nice if they had. Cups are not interchangeable with other Ninja models and you cannot use a mason jar instead of the cups that come with the unit. The Nutri Ninja cups have little tabs at the top of the cup/mug that lock into the motor base. If those tabs break, you will need to replace the cup. Jars are interchangeable with the Nutri Ninja Auto IQ. The blender is suited to be used with 120v-60 HZ.. Do not attempt to use unit with other voltage. If you are not in the USA you might be able to get it from your local dealers. The motor is very powerful, it has 900 watts. The Deluxe version also comes with 900 watts. The motor is a bit noisy but not noisier than a normal blender. If the appliance gets overloaded the motor will stop. I think this is a great safety measure. Remove some of the contents of the cup, wait for a couple of minutes and try again. The unit comes with polarized plugs. This means that one blade in the plug is wider than the other one. If it does not fit in your plug turn it around and try again. It will only fit one way. If it does not fit at all, you need to contact an electrician to adapt your plug. The Nutri Ninja has no buttons at all. It is very simple to operate. . The cups act as a button when you pulse it. Fill your chosen cup with the ingredients, twist the blade until it fits tightly. Lining up the tabs with the base place the bullet (cup) on the base and press down to pulse it. Unlike the Nutribullet, the Nutri Ninja is not hands free. You cannot lock the cup and let it run. You need to press it constantly or pulse it constantly. You may need to stop the blending process to shake the contents in the cup. Either open the cup and mix it with a spoon, or shake the cup for the ingredients to move around. The Nutri Ninja Pro comes with one set of extractor blades. It does not come with a flat blade. The blade has four prongs on it. Two of them face upwards, and two downwards. It is a powerful, thick blade, engineered to break down fruit and vegetables. There are not any rubber or plastic gaskets to seal the blades. If your unit leaks then you need to check that you have screwed the blades correctly, and that you have not overfilled the cup. The blades spin at 21000RPMs. The blades seem to be in contact with the food all the time, everything gets processed well. The blades are made of a high quality stainless steel. The blades are rust-proof. Cleaning the Nutri Ninja Pro is very easy. All cups , lids and blades are dishwasher safe. Place them on the top rack of the dishwasher. If you clean your Nutri Ninja as soon as possible then cleaning is a breeze . The easiest and recommended way of cleaning it is to fill up the cup with luke warm water, add a drop of dishwashing liquid and a drop of white vinegar. Twist the blades on the cup and then pulse it for 30 seconds. It will quickly get clean. Do not submerge the motor base in water. Just wipe it with a dump cloth after every use. Overall the Nutri Ninja is very easy to clean. .
For some accessories and attachments click here. There are two version of the Standard Nutri Ninja. One is the Nutri Ninja Pro BL450, and the other one is the Nutri Ninja Deluxe Bl451. The difference is that the later one comes with an extra 12 oz cup and lid. Nutri Ninja has also released the AUTO IQ version of it. This is more automatic version. There is no need to pulse it continuously. Basically it is the same Nutri Ninja but it can run hands-free and automatically. You can read a more detailed review of the Nutri Ninja Auto IQ here. The dimensions for this blender are not specified in the manual. The product carries a one year warranty. Replacement parts are easily available through the Nutri Ninja website. You can easily get cups in 12oz, 18 oz or 24 oz. Extra lids and extra blades are also available at the manufacturer site. if you want to use your cup as a shaker, you can purchase a shaker lid, a silicone grip sleeve and the Nutri Ninja guide to Nutritional Goodness. Simple Operation: It has no buttons. Great job breaking down pulp, seeds and nuts. Good blending performance, super fast and smooth. It is small enough to leave on your countertop . Dishwasher safe (not the power base). Both cups fit in the fridge. You can blend and serve in the same container. It can be used as a personal blender. Can prepare customized drink for each person. Can be used to prepare soups and dips. Does a great job of breaking the cellular wall for increased nutrition. Parts and accessories are readily available. Great for grinding coffee, spices, grains and seeds. The ridges of the cup can catch some of the ingredients. The Sip & seal leads need to be redesigned. They can leak. It does not completely pulverize berry seeds. It needs liquid to blend. It cannot really prepare nut butters with it. It needs space to store parts and accessories. It does not replace a food processor. One extra pulse might leave you with undesired results. There is not always enough space to fill up water, so smoothie may be quite thick (depending on ingredients). Single serving machine, not for large family. You cannot put the whole fruit or vegetable in the cup. You need to prepare fruit cutting it in small pieces and feeding it in certain order. If you intend to use it as a juicer, the juice is watered down, since you need to add water to process it. Plastic containers can easily break. If the plastic nubs that are used to lock the container break off, then the container becomes useless. This product is very popular with a rating of 4.5, 87% of the ratings were 4 and 5 stars. This indicates that people are really happy with it. Of course there is always the people that do not like the product or do not see the benefits of it. The price of the bullet is low compared to their competitor. This blender is quite affordable if you compare against high-end blenders. Of course, there are other blenders which are cheaper than this one, and perhaps perform better than this one. So you need to look at the holistic cost of the unit. It is convenient, does not take space, fast, efficient and you can take it with you wherever you go. You also need to consider the durability of this item. It looks a strong unit, but it is relatively new, so I cannot say much about durability. But due to the low price the risk is minimum. My review conclusion is that I really liked this blender. If I could not afford a high-end blender, I would go for this cone. It is great for dips and sauces, salsas and even grinding (Though the manufacturer does not recommend it for grinding). Remember always to consider what you want to get out of the blender. If I wanted a blender mainly to prepare hot soups or nut butter, then I woudl look at other options. If I valued the ease of use, the space in my kitchen, the versatility then I would certainly consider this one. If I already had a powerful blender I would not consider this one, unless I was looking for something quick to use, when I feel lazy to get the big blender out. Overall I like this blender, and I would definitely consider getting one for myself. • You currently do not have a good blender and do not want to pay a high price for one. • If you are not a perfectionist. • If you drink smoothies often. • If you prepare lots of dips and sauces. • If you travel often and like to have daily smoothies. There are many people that are very satisfied with this unit. As said this unit is relatively new, and we do not know the durability of it. But Ninja has some very high quality products, so I am trusting this one is one of them. Hi Karen, I apologise for the delayed reply. Thank you for visiting my site. AS per the blender manual the cups and accessories cannot be placed in microwave. They may get damaged. Sorry for delayed reply. I suggest you contact the Manufacturer at http://www.ninjakitchen.com/ They have a chat support or you can phone them. They will require your unit number.